﻿﻿﻿﻿﻿﻿﻿﻿﻿﻿﻿﻿﻿﻿Can you imagine a family trip to a small Asian country that still retains its old cultures, emerald green rice paddies, sparkling sandy beaches and one of the world’s seven wonders next door? We travelled to Vietnam with our seven year old granddaughter, Mya, and her parents, Rhonda and Jason. It was one of the most remarkable and memorable holidays we have ever had, and we have traveled to many places throughout the world. It is fascinating to see the world through a child’s eyes. My story is a gift to our granddaughter and to encourage other grandparents to travel with grandchildren and experience similar joys and wonders. Our daughter, Rhonda, and her husband, Jason decided they would like to visit Vietnam for Christmas. What a privilege when they asked us to join them and we didn’t hesitate to say “Yes.” John was keen to support our daughter in planning the Vietnam trip. He searched the internet and read, “Lonely Planet” and “Let’s Go”, a gift from Rhonda, looking for information and country highlights. In the meantime, Rhonda was busy researching the best airline to fly to Hanoi, looking for activities that would be fun for the whole family, and searching out hotels in different cities. Jason and I just had to relax and wait for the plans to unfold. Many emails and phone calls flowed back and forth for several months as the plans were formulated for our vacation. Rhonda started the idea in early spring for our December holiday. It was necessary to start early as Christmas is a busy time for vacationers all over the world and it’s a good idea to establish where you will be for Christmas. We planned our holiday for the month of December, leaving our small town of Powell River early on the morning of December 1st and returning on December 29th. The weather was warm in Vietnam in December. We had expected to encounter rain as December is considered part of the rainy season but it only rained one day while we were in Hoi An, but otherwise we had excellent weather, not too hot, but warm enough to enjoy each day. We usually started the day with a long-sleeved shirt or a fleece but it wasn’t long before it was shed. It was cooler in the north than in the south and the air was fresher in the north, compared to the air pollution in Ho Chi Minh City. We decided to start in the north and travel to the south as we would be closer to our Christmas destination on Phu Quoc Island. Rhonda’s research determined Asiana Air, a Korean airline, to be the best flight option with a great service record! This meant we had to fly from Seattle, to Seoul, Korea, change planes and continue to our final destination of Hanoi, Vietnam. We drove our four-door crew cab Chevrolet truck to Seattle as there was plenty of sitting room for five of us and a good roll-back covered box which held all our luggage. We arrived at our hotel near Sea-Tac Airport by 6:00 pm just as it was getting dark. We were soon assigned our rooms in Sleep Inn Hotel which we had booked earlier in the month. The good news about this hotel was, they had a free continental breakfast and we could receive two weeks free parking for each room booked. John phoned them using “Skype” and negotiated four weeks free parking since we had booked two rooms, and they agreed. At 9:30 in the morning the shuttle transported us to the Sea-Tac Airport. We got our boarding passes at the check-in kiosk and waited for our Asiana Air flight to Seoul, Korea. Our memorable “tug-at-your-heart” adventure had begun! Rhonda brought two pillows for the plane as a mattress for Mya to sleep on as it was a twelve hour flight. However, things went so well for us that the pillows were unnecessary. The plane was only two-thirds full so Jason and John acted quickly to secure extra seats. Jason moved to another row of three seats and took the complete row, while Rhonda and Mya were in the original row. After we were in the air and the seatbelt sign turned off, Mya came to visit and told us they had two rooms- a bedroom and a living room. She explained that if you wanted to sleep you went to the bedroom- the first three seats, otherwise you stayed in the living room- the second three seats. We chuckled at Mya’s explanation. It was a successful plan as we often saw one family member asleep in their “bedroom.” This is one of those times when you see the world through a child’s eyes. The flight surpassed all our expectations with superb service, comfortable seats, quality food, and little turbulence. We were served two meals on our twelve hour flight with free alcoholic drinks and all the juice, water, coffee or tea we desired. I was surprised at the excellent service and the newness of the plane, considering it was the cheapest air flight Rhonda could find. We crossed the International Date Line and arrived in Korea by noon Korean time, but we had lost a day. It has always puzzled me as to where that day goes. I write a daily journal for each holiday and it’s confusing when Wednesday follows Monday instead of Tuesday! I told Mya about the predicament and explained to her how we lost a day. I can’t understand it myself so I’m not sure that my explanation helped her understand the Date Line but maybe one day she will be able to explain it to me! On arrival in Korea we changed planes for our six hour flight with Asiana Air to Hanoi with excellent service once again. After clearing customs in Hanoi, we grabbed our luggage and booked a taxi van to our previously booked central Thaison Hotel II in Hanoi’s Old Quarter. Our room was on the third floor and the Mya's family on the fourth floor so Mya had fun going from one floor to the other. After a good night’s rest we were off on our beginning adventure after our first of many Vietnamese breakfasts. We hiked to the Hoan Kiem Lake which was a ten minute walk from our hotel where we wandered past many street-side noodle shops, vibrant and cheerful Vietnamese faces, and noisy motorbikes and cars maneuvering through the traffic. A red wooden bridge connects an island in the lake to provide access to Hgocson Temple Hoankiem, a famous Buddhist temple on the lake, often photographed in travel magazines to promote a holiday to Hanoi. Of course, the family had its photo on the bridge too! Mya didn’t seem nervous about her new culturally different environment but Rhonda had told her in advance that people would like to touch her head as it was a novelty to see strawberry-blonde hair. It didn’t take more than five minutes before people were “oohing” and “aahing” as they looked at Mya. One older man touched Mya’s cheeks, not once, but twice. Mya wasn’t sure she liked that but I watched the expression on the old man’s face and a mountain of memories seemed to come flooding in, perhaps reminding him of when the Americans had been in their country. Mya wasn’t sure she liked it and her mother reminded her that she could say, “No”. Many, many more times people would touch Mya’s hair or want a photo of her, and Mya was gracious and managed very well with all the attention. Mya gave Canadian pencils and pens to people whom she encountered or who helped us. She would give them to taxi drivers, hotel reception clerks, little children in a restaurant or elephant drivers and it was always with the same respond- a big smile and a bow. She was our little magnet! While we were in this vicinity we decided to travel by tuk-tuks which are three-wheeled bicycles driven by a driver using foot pedals. There is a small covered bench in front of the driver for passengers. Jason was in one, Rhonda and Mya in another and John and I in the third. We rode part way around the lake to a coffee café which was great fun. Each ride cost about 150,000 Vietnamese dong or $7.50 Canadian. As we maneuvered through the traffic Mya could be seen smiling back at us from her vantage point. Mya is a natural model often posing for photographs. It is a skill that will be useful to her as she gets older. When Mya was born prematurely she only weighed two pounds. It is hard to believe that this little “rat”, as I used to lovingly refer to her when she was first born, could become a bright young girl with a curious, dynamic and unique personality. Mya adapts to all situations and is happy with all her extended family. So many times on this holiday I appreciated this little one for who she is. She would thoughtfully consider new situations before participating and would demonstrate a cooperative spirit that was very mature. I should give credit to her parents for some of this, but I think Mya has built her own lifestyle, even at seven years of age. I will give you an example. One day after we arrived at our new hotel Mya immediately dumped her whole suitcase onto the floor. Jason said, “Mya that is no place to put your clothes.” Upon which Mya replied, “That’s how I roll, Dad!” Mya was constantly making us laugh, which is such a healing stress-relieving balm when traveling. Another time Mya made us laugh when I had asked what Mommy and Daddy were doing and she responded, “Mommy’s itching her hives and Daddy’s lying down.” Kids tell it like it is. Through an internet organization Rhonda discovered that Hanoi student guides were available free of charge. They wanted to practice their English as they took tourists around the city. They could not legally accept money, but small gifts were suitable. Tai, our student guide, gave us a tour of the Vietnam Museum of Ethnology, native tribes’ homes and a water puppet show. Tai had his special haunts, probably pre-arranged, like the Weasel Coffee Café where the vendor offered us delicious iced coffee. He explained that the coffee beans were swallowed by weasels which they defecated. It sounded strange but it was suppose to make excellent coffee so we purchased bags to take home. Jason and Rhonda needed another suitcase as theirs had broken so they asked Tai where to get one. Once again he had his special small store away from the center. Jason purchased a suitcase from a choice of two suitcases and then asked about a used cell phone which he was also able to purchase from the same merchant. Later it was decided that they paid too much for the poor quality suitcase but the cell phoned served us well. For lunch Tai brought us to Quan An Ngo Restaurant, a very busy and excellent Vietnamese eatery. We especially enjoyed the extra large crepes filled with fresh green vegetables, bean sprouts, and spring onions served with a dipping sauce. Mya tucked right into the crepe using her chop sticks with agility. This was our first, not counting breakfast, of many excellent Vietnamese meals! During our stay in Hanoi, we enjoyed eating delicious food, like “pho” which Jason looked forward to, especially for breakfast. Pho is a dish mainly of rice noodles, beef or chicken broth with a little meat, loaded with fresh herbs, and sprinkled with chopped green onions. It is popular all over Vietnam and we must have had it every day for one meal or another. Both Jason and John predictably ordered spring rolls for lunch or dinner which was another one of their favourite dishes, one would guess! We just shook our heads. After three wonderful days in Hanoi, we loaded onto a shuttle bus for a tour of Halong Bay, about a four hour drive to the northeast. It’s a very popular place for tourists. Rhonda made an executive decision and booked staterooms on Dragon Pearl 1, through Indochina Junk, for a two day, one night excursion. The wooden pirate-style ship with redwood walls and floors, queen size beds, glass enclosed double-headed showers, and fancy counter-top sinks was spotless and had an exceptionally well organized staff. We sailed to Cat Ba Island and upon our arrival disembarked into small Dragon Pearl skiffs to transport us to a small beach. Some people swam in the cool water at the beach but most of us chose to walk to a cave further up the hill where we entered a large cavern with many stalactites and stalagmites. We walked out the back of the cave to another beach and then returned through the cave to our junk. Mya and family joined others for a short swim in the cool water from the deck of Dragon Pearl 1. The crew had towels and a tub of hot water ready to rinse feet before entering the cabins. After showering and dressing for dinner, we relaxed on the deck loungers before enjoying our nine course dinner of soup, salad, seafood, rice, chicken, fresh fruit, wine, and coffee. The table setting, cuisine and setting sun were storybook perfect. In the morning Dragon Pearl 1 dropped anchor near a floating village. We had to transfer into bamboo tenders to reach the floating village where we observed fish farms and pearl farms that used mussels to make pearls. The village contained a small school and tourist shops selling paintings, weavings and pearls. On our return to Dragon Pearl 1, we ate an early lunch and then set off for Halong Bay City to disembark and walk to our pre-arranged rental van for a long trip to Ninh Binh and Cuc Phuong National Park. Arriving late in the day, we stayed in the Cuc Phuong National Park where we rented rooms in a two-storey colonnade building away from the central reception area. We were in the forest and heard animals near at hand. Jason and Rhonda had one side of the top floor and we had the other side. At one point the electricity went out which I guess was a usual occurrence in the park, and we got out our trusty headlights and found some candles. However, it wasn’t long before the electrical power was returned, to Mya’s great relief. After erecting mosquito nets over our beds we hiked up the road to eat dinner in a small park restaurant before heading back to our hideaway rooms in the forest. We played cards for a short time in the Zroback room while Mya slept in her bed. The next day we walked about 200 meters from our house to meet our guide who would show us the monkey and turtle conservation area. There were several types of monkeys in cages which were tagged with computer chips before they were released to the nearby forest. If they adapt successfully they are placed in different areas of the wild forest. The problem is poachers! The turtles and small tortoises were also there in terrariums or aquariums and both the monkeys and turtles were bred in the conservation area. The park was well worth the effort of the drive from Halong Bay. The park manager arranged a taxi van for us for a day tour of park sites and on to Trang An Grottoes. These grottoes had been newly developed for tourism and lacked the crowds and “hard sell” of Tam Croc Grottoes. We had a marvelous tour in one small bamboo boat which held all five of us with a woman paddler/guide. There were sixteen limestone caves and we went through at least thirteen of them along the Sao Khe River. We took oodles of photos and saw beautiful stalactites. The caves were well lit so we could enjoy the whole journey. Our daughter, Rhonda, thought the caves were the highlight of our trip so we were glad we went. Jason suggested we return to Hanoi and not stay in Ninh Binh since we would be flying out of Hanoi the next day. We thought this was an excellent idea. The return trip to Hanoi was only two hours from Ninh Binh but made for a long day for our taxi driver. He spent the whole day driving and waiting. It was excellent service and he certainly earned his tip. We expected to be able to get back into Thaison Hotel II, but there were no vacancies so we took a sister hotel which wasn’t as nice, but was still of a good standard and centrally located in Hanoi’s Old Quarter. We returned to the excellent Quan An Ngo Restaurant that our student guide had taken us to earlier in the week, stopped at Hoi Chi Minh’s summer home and attended a movie house viewing “Harry Potter”, with English sub-titles. We rushed back to our hotel to gather our bags to wait for a taxi to the airport. The traffic was heavy so the taxi arrived late, but we arrived in time for our flight to Hue. We had booked this flight from Canada and John and I didn’t realize that we were in Business Class! There were no other available seats when we booked it and we had forgotten our decision to go “Business Class”. It made us feel like royalty with a separate lounge for drinks and food and a separate shuttle to take us to the plane. Who would have guessed? Our “poor” family ate in a crowded restaurant and paid for their food while we ate in luxury! Mya joined us for some chocolate treats and Rhonda soon appeared too. On the plane we were given constant attention with drinks and special foods of open face sandwiches and gelatin-covered cake. It was also amazing to have larger seats with only two of us sitting side by side. Business Class is something to consider if it isn’t too expensive! Obviously we got a ribbing about our “First Class” tickets! We flew to Hue rather than take a van as it is inexpensive to fly with Vietnam Airlines and the road from Hanoi to Hue is long and narrow and goes up over the mountains, which makes it difficult. On arrival we ordered a taxi to take us to our internet-reserved hotel rooms, which were modest but nice. We were soon off to rent bicycles or motorbikes, which Rhonda had researched. Jason rented the motorbike and took Mya with him and John, Rhonda and I rented bicycles. We started down the alley from our hotel and onto the main street. Everything went smoothly and I kept my balance, allowing much traffic past me without worry, so we were ready for the big highway. Oh dear! Rhonda was leading and I just kept my eye on her blue shirt and followed along and over a bridge which naturally narrows with no shoulder. I kept peddling as crowds of bicycles moved all around me and then I spotted stop lights at the bottom of the arched bridge. Now what was I to do? I realized that Rhonda had already gone through the light as I saw her shirt on the other side of the street. I looked up at the light and saw that it was still green with four seconds to go so I pumped like crazy through the traffic light to get to the other side knowing that John was following me. I didn’t think he would make it through but he was closer behind me than I thought and there he was right beside me. Jason and Mya in the meantime were waiting further up the street and to our delight Jason was taking photos of us. The best thing about this was Rhonda’s “thumbs up” as we crossed that busy intersection. Mya loved riding with her dad on the motorbike and when Jason passed us on the road she called out, “Hi Grandma, Hi Grandpa.” She rode in front of Jason with her little helmet on and looked the picture of joy. Jason was also pleased as he got the chance to ride the motorbike, which he loves. I wouldn’t be surprised to see Mya riding a motorbike in a few years! We particularly enjoyed Hue as there are many old Royal temples to visit that haven’t been changed, providing you with a glimpse into the past. The town isn’t as big as Hanoi so we could get around easily. We went to visit the Emperor’s Citadel and the Royal Tombs. The citadel has two meter thick walls with three straight sides and one curved to follow the bend in the river and the walls are ten kilometers long with a 30 meter wide moat to protect the structure. During the Vietnam War in 1968 the Vietcong shot more than 2500 people and the Americans came in and recaptured the city with a loss of 10,000 people. In 1975 the North Vietnamese forces returned and captured Hue after three days. Much of the Imperial Enclosure was damaged during the war but the walls held up. On our visit to the royal chambers, Rhonda and Mya dressed in authentic royal costumes which were provided to the tourists for a fee. Rhonda wore a white satin gown with a yellow headdress and Mya wore a pink satin robe with matching headpiece. Many photos were taken in their beautiful costumes for memory enjoyment when we returned to Canada. In the afternoon we rented a car and driver to tour three more temple sites along the banks of the Perfume River. We stayed in Hue three days, which was our pre-determined plan for most cities. It gave us time to get settled into our hotel, reconnoiter the area and still have a full day to enjoy the city sites before travelling again. This plan worked well for us. Our next stop, Hoi An, was about four to five hours south. We hired a private van from Hue to Hoi An so we could enjoy the scenery along the way and stop at interesting places to see. Our first stop was for coffee at a resort north of Danang where we used facilities and then sat on the deck overlooking the ocean while sipping our refreshments. We climbed the Hai Van (Sea Cloud) Pass of the Truong Son Mountain, stopping at the summit where John and Jason wandered up to see the war’s fortifications while Rhonda, Mya and I interacted with the hawkers who sold their wares. There is a shorter route to Hoi An via a 6280 meter tunnel, which shaves off an hour of the journey, but we chose to take the more scenic route. Animal and fuel trucks are not allowed in the tunnel. As we drove through Danang and Marble Mountain I felt a pang of sadness as we approached China Beach which is basically not accessible to the general public as large resorts and hotels are filling the area. After this it was a short hop to Vinh Hung Riverside Resort, in Hoi An, which Rhonda had booked on the internet using our computer while we were in Hue. On arrival we were assigned two rooms overlooking the pool which were perfect for our needs. In only a few minutes Mya was enjoying the pool with her parents and we soon joined them. Later, as we ventured into the town of Hoi An, (which Rhonda and I kept confusing with Hanoi when we talked about the town), there were many Christmas lights displayed along the river’s edge. When we walked down our street near the river and up two blocks to the boardwalks which framed both sides of the river, we immediately encountered gorgeous illuminated shapes of turtles, clowns, trees and other fascinating forms floating in the river. As we walked onto the arched bridge admiring the beautiful displays, we took photos under the Hoi An name, like most tourists were doing; then we walked the streets on the other side and looked at all the fabric stores displaying garments of all sizes and shapes, and other curio shops. We found an excellent restaurant, which wasn’t difficult as there were many to choose from, and we took pleasure in our evening feast in Hoi An that would be duplicated many times in the coming week. Hoi An is extremely popular with tourists as it is a shopping paradise with tailors on every street corner. There are many choices of fabrics and many tailors to choose from who sew the well finished garments within a day to two. It is relatively inexpensive compared to North American prices. Jason and Rhonda exuded excitement as they ordered tailored-made suits, pants, dresses, shorts and shirts. Rhonda had researched the best tailor, Yaly on 47 Nguyen Thai Hoc St., Hoi An City. They had great fun going back to get more fittings and sometimes another outfit. As it turned out we stayed in Hoi An six days, which wasn’t our plan but it allowed lots of time for clothes shopping, rest and relaxation. When we arrived in Hoi An, Rhonda’s cough was getting worse so we booked extra days in the resort and on the third day with Rhonda’s temperature reaching 38 degrees, she saw a doctor who prescribed three medicines for a throat infection. While Rhonda and Mya ordered in pizza that night, the rest of us walked into town to Cargo Restaurant for supper. I had lemon-grass chicken stir-fry, John ate white fish fillet and Jason enjoyed red tuna. Then we stopped for ice cream and coffee in another little café. We stayed three more days for Rhonda to regain her strength. Mya enjoyed swimming all day long and met two young girls from Singapore and the three became great swimming buddies. In fact, one day the girls’ parents invited Mya to go with them to another town to shop and have lunch. Jason and Rhonda had met the girls’ parents beside the pool and enjoyed their company so when the girls’ mother asked to take Mya it wasn’t a problem. The mom bought Mya and the two daughters each a bracelet and necklace. Mya had been adopted for the day! Our resort offered free Vietnamese food most afternoons between four and five, which was a real treat. We would usually buy a drink and then enjoy the “Happy Hour” food, of noodles, spring rolls, bean treats and sweets so we soon became full, sometimes abandoning the evening meal. One thing we discovered about Vietnam is that it is well set up for tourists and it hasn’t become expensive yet. While in Hoi An, Jason rented another motorbike, similar to the one he had in Hue. He was keen on taking the bike out and investigating the countryside along the seashore. Sometimes, in town, he took Mya with him which she really loved. Rhonda, John and I walked into town crossing the little popular bridge and along the streets to join Jason and Mya who would be sitting in front of the restaurant patiently waiting with big grins on their faces. Later we strolled along the street peering into stores to view what we might purchase. Mya was keen on the silk scarves with their bright and varied colours of yellow, fuchsia, purple, or orange. Rhonda and I just loved shopping! A funny thing happened on our last day in Hoi An. Rhonda and John booked Morning Glory Cooking Class for all of us to attend. We started at four o’clock, because another large tourist group booked the area immediately following. Moon, our excellent instructor’s nickname, explained all the different fresh herbs they use in Vietnam for different dishes. Some of these herbs are basil (lemon and sweet), lemon grass, morning glory, cilantro, and small garlic which have a stronger taste than large ones. There was a tilting mirror above her gas stove and counter, enabling us to view what she was doing. When it came time to cook, Moon told me to use her station and then all four adults and Mya could make spring rolls and crepe pancakes at the same time. Our instructor explained how to heat up the pan and that the timing was important in the cooking process. Almost immediately John’s pan caught on fire with flames about two feet high and Mya’s eyes were as big as saucers! The flame was put out quickly but Mya kept her eyes on Grandpa in case of any more surprises. Mya had an opportunity to cook too with Mom and Dad’s assistance, an activity Mya enjoyed. We all wore Morning Glory aprons and later received recipes and zest tools to take home. Our instructor made a green papaya salad to accompany the food we had cooked. She used a special peeler that was double-bladed in the middle and very sharp. Jason decided he would like to buy two right-handed ones, one for himself and one for his brother, Jamie, who loves to cook. After we dined on the delicious food that we had created, we were guided into another room to relax and enjoy dessert and coffee while the staff set up the cooking room for the next tour. After six days in Hoi An, we took a taxi to Danang Airport, stopping at China Beach for photos. We opted to fly with Vietnam Air rather than drive as flying is very reasonable. Dalat is a mountainous flourishing artistic town, with alpine forests, adventure tours and waterfalls. We had not pre-booked our hotel so on arrival we had a taxi take us to several hotels without success. I spotted one in the central part of the town and made a note of it on a piece of paper. After Jason and John had checked more hotels without success we decided to give the one I had chosen a try. When Jason and John returned from the pink-sided central hotel, we knew we were in luck. We took our bags from the taxi and entered our hotel rooms. Jason had chosen a beautiful large room overlooking the street with loads of windows and John chose one further back to eliminate street noise. Well the noisy street side was a problem so the next day Rhonda, Jason and Mya moved across the hall from us to a much quieter room. Dalat’s mountainous air is cooler at night causing us to put warm fleeces on before we headed out for supper. We ate at Long Hoa Restaurant, and had sweet and sour soup, noodles, rice, chicken and stir-fry vegetables. We also found an excellent bakery on the up-hill street so Jason picked up donuts and croissants to eat later. The cold air had given us appetites! We experienced different outdoor activities in this town, one being a slider ride. You sit in a rubber wheeled sleigh which rides on metal rails and takes you down a steep slope, zigzagging all the way to the bottom, with warning signs along the way to use the brake. We watched as a bride and groom got into a slider. The bride had hoops under her a full-length red gown so she pulled them out and passed the hoops to the photographer who was riding in the next car. I was next to get into a slider and not knowing exactly what to do I was rather tentative on the curves, holding up John who was behind me and then Rhonda with Mya who called out, “Faster Grandma, faster!” Jason fortunately waited five minutes before he left so he could go all out. He loved it and wanted to go for a second ride! When we got to the bottom we saw the bride posing on the small arched bridge in front of a sparkling waterfall which made a beautiful backdrop for photos. After spending about ten to fifteen minutes at the bottom of the hill and taking photos, we came back by the same system which automatically pulled us up. We didn’t have to worry about using the controls or slowing down. After arriving back at the top of the hill we hiked to another tourist spot where Rhonda and Mya experienced their first elephant ride. Mya knew there were elephant rides in this region so she was excited to ride. Upon arrival we saw the large beast in the distance and Mya watched in awe as the trainer brought the elephant to the platform for the next customer. Rhonda wasn’t sure as she’d seen the elephant shy as a dog barked close by. Mya took the stairs up to the platform with the help of her parents eased herself into the wooden carriage on the back of the elephant. Rhonda overcoming her doubts, joined Mya for the elephant ride while Jason took photos and Grandpa and Grandma watched with interest. Mya loved the ride and sat like a little princess watching curiously as the animal swayed from one side to the other along the narrow lake-front path. After the elephant ride Mya hiked up the mountain trail keeping up with the adults as we trudged to the top of the hill. The second night in Dalat we walked the uphill street looking for another restaurant. When we got to the top we arrived at a square where many vendors were selling their wares. One fellow had little rockets which lit up as they shot into the air and then parachuted down to the ground. Mya, of course, wanted one so Jason bought her one. She had fun pulling on the elastic band and shooting it as hard as she could up in the air. She was concerned that she might hit someone as she pulled on the elastic, so she would step away from people before she let it go. There were also small rubber balls which lit up when you bounced them so I said to John, “Get one of those and we’ll put it away for Christmas for Mya.” I just stuck it in my pocket and nothing was said about it. Of course, on Christmas morning she got her colourful ball. If John and I had been travelling alone, we wouldn’t have taken the opportunity to enjoy a child’s toy, but traveling with Mya made it so intriguing. Another adventure in Dalat was to visit the Crazy House, and possibly book a night in it. Mya really wanted to stay there as Rhonda had told her all about it in Canada when she had checked it out on the internet. When we arrived at the Crazy House we recognized it right away as it looked like a tree with many extended branches. It was made of cement with more rooms and fanciful characters being added even as we visited it. There were several bedroom suites for rent and tourists viewed them as they meandered throughout the narrow cement walkways that joined one part of the creation to another. There were mythical characters and interesting fabrics and artifacts throughout the rooms. Beds were often raised into a loft and wooden tables and chairs made into animal shapes. We spent a couple of hours there just enjoying the fantasy but Jason did not like the idea of staying overnight as it was open to the night breezes and bugs, so Mya did not get to stay in the Crazy House. Our last night in Dalat was memorable. Mya loved the silk colourful scarves we had seen in Hoi An stores but she didn’t have one yet. While I was in Hoi An I had purchased a scarf to match my new tailor-made dress but later I found another one which I thought matched the dress even better. Mya was in our room watching me dress as I put on the second scarf for our final night in Dalat. I could see she really liked it so I pulled out the first scarf and handed it to her. She took it and looked at me and I said it was a gift for her. She immediately hugged me and ran to her parents’ room. Rhonda asked, “Did Grandma just loan this to you?” but Mya kept saying it was a gift. Mya returned to our room and climbed up on a chair so she could see herself in the small mirror and began to try different ways of tying her scarf. It was such a delight to watch her. She finally decided she would do what Grandma did, fold it in the middle and wrap it around the neck and through the fold. Even then, it hung down long on her but I saw that scarf many times during our holiday. I was so delighted to see her wearing her new scarf with her Hanoi white and fuchsia satin dress, as we headed out to eat in the Art Café. Rhonda had wanted to eat at the Art Café ever since we had checked it out on a Sunday when we found it closed. We had heard good things about the restaurant but more importantly, the owner was a well-known artist, hence the name, Art Café. When we sat down to our table, Rhonda and Jason were looking directly at the painting that Rhonda had seen earlier. They both liked it. Since the artist was willing to take us to the hotel to view his work, we all got up and left our table and went next door. Many paintings were on the walls and Rhonda and Jason spotted another painting they both liked. The first one measured two feet by three feet in red tones and was called “Fire Earth"; the second one in blue tones was only slightly smaller. Jason offered to pay cash and the deal was finalized. They were delighted and so was the painter, Vo Trinh Bien. Rhonda had researched the artist, Vo Trinh Bien, and discovered that he is internationally known for his style of painting using his index finger to paint. While we ate our meal he painted a small black and white picture using his finger, which looked like bamboo with our five initials embossed over the background. John and I now have it hung in our entrance hall. After three days in Dalat we flew to Ho Chi Minh City or Saigon as many people refer to it. At the airport Mya could be seen with her backpack, one picture tube, and her passport as she approached the customs agent. We were often in awe of her maturity and independence as she took responsibility for her luggage and even her passport! We only had a few hours in HCMC before our flight to Siem Reap, Cambodia, so on arrival we put our time to good use and visited the Cu Chi Tunnels. We took a taxi to the tunnels, which is one and a half hours from the airport. The tunnels are the only part of our trip that seemed not to change over ten years; the only difference would be the popularity of the site with the vast number of tourists viewing them. On arrival we waited in line to buy tickets while our driver went off to park the vehicle in what seemed a full parking lot. Finally we were ushered in and taken down to an underground viewing room, where we watched a video of the war in Vietnam from 1960-1975. The tunnels were used by the Vietcong to attack the Vietnamese and the Americans. They had underground food and supply storages, medical areas, kitchens and HQ centers. Some were 60 feet deep! The tunnels ran for miles underground with air-vents opening into deserted termite nests where the vents were not readily visible to the naked eye. They had several escape holes from the tunnels too. During our tour I volunteered to get into the tunnel hole and hold the wooden lid above myself. I got in but I needed help to get out. Mya would have liked to do it but she knew it was too far down. Jason tried it too while the rest of the family watched, but he couldn’t get all the way down because his shoulders were too broad. The guide showed us many different traps that were used during the war, one being a wooden door with spikes on the underside that swung over when you stepped on it, causing you to fall into the pit and be struck with spikes. There were also leg traps, like the ones for wild animals that could break your foot. In some of the displays there were mannequins outfitted in guerrilla garb with the necessary artifacts to demonstrate the authenticity of the war, so we stood with the display models for more picture taking. Our guide allowed us to go into a tunnel, which we did with difficulty even though it had been widened for tourists to get through. We definitely were bent over and felt somewhat claustrophobic during the experience. We all opted to get out at the first exit but a few tourists tried to go further where the tunnels narrowed, with some of them turning back. After touring the Cu Chi tunnels for several hours we caught a taxi to return to the airport to board our afternoon flight for Siem Reap, Cambodia, a forty-five minute flight. We were hungry and after clearing security we had time to eat before our flight. We stopped at an airport Japanese restaurant and had sushi, which was a nice change from Vietnamese food. On arrival in Siem Reap we took a taxi to our five-star Tara Angkor Hotel, pre-booked on the internet. Mya immediately headed for the hotel pool to swim. It had been a long day and we were tired so we all relaxed poolside in loungers then ordered food and drinks from the pool attendants’ station. Cambodia seemed hotter than Hoi Chi Ming and the cooling pool waters were just what we needed. Siem Reap has grown in popularity with wall to wall resort-style hotels and restaurants. We spent two nights and two full days here visiting the ancient sites. fed roadside monkeys. 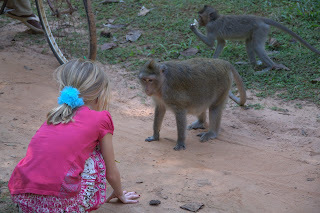 Mya fed bananas to the elephants and also to the monkeys which was a harder task because some of the monkeys were very aggressive. Do you want this banana? Angkor Wat, built in the 12th century, is considered one of the seven-wonders-of-the-world and if you visit it you will know why! We stayed around the main site the first day and our tickets were checked regularly as we wandered from one part of the huge complex to another. The tickets cost us $20 each and they were good for one 24 hour period so we were able to leave the site in early afternoon and then return after a needed lunch break. One of the benefits of travelling with Mya was that if she got tired and needed a rest, it gave us an excuse to rest! We took lots of photos around the ancient site using the panoramic view of the structures as a backdrop for our photos, especially Bayon, which has a small lake in front of it so we could get the reflection of the temple. The giant stone faces of Bayon have become one of the most recognizable images connected to classic Khmer art and architecture. There are 37 standing towers, most but not all, sporting four carved faces oriented toward the cardinal points. We visited the site on December 21st which happened to be a holy day so we were not able to climb up to the top of the temple. We also visited two more temple sites close to Angkor Wat. One is Angkor Thom, which we enjoyed because it had many gnarled trees entangled in the stonework. The trees appeared like reptiles with their twisted roots being pushed around the strong rocks. The other site, Ta Som, had even more contorted trees entrapped in the stone work which made for fascinating black and white photos. There are so many temples and ruins located in this area but the most important are Angkor Wat and Bayon. A history student would want to spend several days exploring the whole complex but it was enough for us to see three sites. On the second day to Angkor we were allowed to enter the grounds without paying as we asked the day before if it would be possible to go in and ride the elephants. Mya loved riding the elephant, especially since both Mom and Dad would be riding with her. She was so small compared to this huge animal and we watched her bouncing along in the wooden chair behind the mahout, as John and I followed on another elephant. The workers had the rides well organized and it looked like the animals were well cared for. After that we searched out our tuk-tuks, our unique two-wheeled wagons attached to a motorcycle, and asked the drivers to stop so we could feed the monkeys. Since it was still early in the day the hungry monkeys were grabbing food from people, with or without permission. It was quite funny as we watched a lady who was riding a bicycle; lose her plastic bag from her handle bars to an inquisitive primate. After three days in Cambodia we hired tuk-tuks to take us to the airport as we had enjoyed the experience of riding them around the ancient site. It took longer than a taxi but was great fun weaving in and around the traffic with our luggage stacked high. We arrived at the airport with all our backpacks and suitcases to depart for Hoi Chi Minh City in late afternoon. On arrival in HCMC we piled into our taxi van, which had been pre-arranged earlier in the week, to drive to My Tho. Although our flight had been delayed, our driver patiently waited for us and took us to My Tho, a two-hour drive, where we found a hotel of choice and were soon asleep in comfortable beds. We opted to stop at My Tho and drive to Can Tho the next day to enjoy two aspects of the Mekong Delta. The next morning we took a two-hour boat ride moving along canals and under bridges and stopped for an elephant fish lunch along the river bank. The fish was so large that you can understand where they got the name. After this we went to see pythons which John and Jason “bravely”placed around their necks. While in this riverside forest we enjoyed local honey drinks while the bees buzzed around the honey pot and later we visited a local candy factory where young women stood to a long table wrapping small white square candies. We departed My Tho and travelled by taxi to Can Tho arriving by three in the afternoon and settled into a hotel near the river’s edge and close to the market. This was probably not one of our favorite hotels but a great river view! After an early-to-bed evening, we were ready for another tour of the Mekong Delta the next morning before boarding our flight to Phu Quoc Island where we would spend Christmas, basking in the sun of the South China Sea. We had a pleasant , 37 year old English speaking guide named Ha. She made us earrings from drinking straws which we put on our ears including Jason and John. Our boat maneuvered alongside other boats which had samples of their merchandise hanging from flag poles in the floating market. We saw sweet potatoes, watermelons, pineapples, pumpkins and sometimes a combination of produce, swinging in the breeze as well as other products like cooking utensils or bottled drinks. We purchased a watermelon and a pineapple from a vendor whereupon Ha trimmed them into beautiful shapes, dropping the peelings into the Mekong, before presenting the delicious fruit to us. After tipping our guide we returned to our hotel and then John, Mya, and I took off to find Christmas decorations. Mya had her own money to purchase decorations and she had her heart set on garlands, which weren’t easy to find. However, after much perseverance in the hot sun and walking on many streets inquiring where to buy Christmas ornaments, we finally found what we were looking for, at which point we purchased a small Christmas tree and Mya bought her colourful garlands of red, blue and green. As we walked toward our hotel in the heat of the day we spotted Ha riding her motorbike. She stopped and offered me a ride when she realized I wasn’t feeling well. I hopped on the bike while John and Mya continued their walk. We met in a pre-arranged restaurant for something to eat, joining Jason and Rhonda. We then returned to our hotel for quick showers and the drive to the airport. We arrived at the brand new airport which had only been opened a few days. Our plane was delayed for Phu Quoc Island but it was only a 45 minute flight and we arrived mid afternoon. Since our shuttle for our hotel was not there we took two taxis, on the drivers’ recommendations, costing us more and arriving at Kim Hoa Resort to a cranky receptionist when we asked for compensation for the cost of the taxis. The drivers had said that the hotel would cover the cost, but that was not the case. Mya couldn’t wait to swim so her mother gave her permission to swim in her clothes until we could unpack. She loved the cool water in the hotel pool and swam from one side to the other while the adults arranged the rooms. After a rocky start we were given two lovely bungalows a few feet from the warm water of the South China Sea. Mya decorated the rooms immediately so I helped her string the garlands onto the mosquito netting supports in both cabins. She flipped the garlands around and around until they covered the string, putting four in our cabin and four in her cabin. Then we sat on the front porch and cut out white paper snowflakes and pasted them around the front windows of each bungalow fastening the snowflakes with scotch tape and soon the cabins looked very festive. We were ready for Christmas the next day! Santa arrived at both cabins for Mya. He left a note in her cabin to say that Santa had left most of her gifts in Powell River, and when Mya came to our cabin she had gifts to open too. They were on the spare bed in colourful tissue paper, brought from home for the occasion, and encircling the little Christmas tree. The first gift she unwrapped was a Vietnamese doll about fourteen inches tall and dressed in pretty fuchsia colors. Next were two little items and lastly a colourful ball that shone colours when one bounced it on the floor. We took photos of Mya in her sleepy appearance with the ball colours reflecting on her face, as she stretched out on the bed. Later she took all the streamers down and took them to the sandy beach to make patterns around the small Christmas tree in the sand. We took more photos. It was a Christmas morning to remember! Mya’s parents were even able to enjoy a sleep-in after probably being wakened at the first sign of daybreak! While on Phu Quoc Island we went swimming daily, enjoying the warm and inviting water with its clean beach. It was easy to get into the sea because it was so warm, in fact, warmer than the waters off the Pacific Coast north of Puerto Vallarta in Mexico where we stay for three months every year from January through March. We also had a swimming pool behind our bungalows where we could take a refreshing swim. The women resort employees gave inexpensive massages to guests. We took advantage of the massages and enjoyed the attention and relaxation we received, sometimes getting two or three massages a day since it was so inexpensive, costing two to three dollars each for over an hour! However, the champion massage client was Mya. She loved getting them but told her mother she wanted the masseuse to press harder. I guess they didn’t want to hurt this little child. After they got used to Mya returning for more massages, at least twice a day, they gave her the complete treatment. One day, after Mya had had a massage she said to me, “Grandma I’ll give you a massage.” I said, “Okay”, thinking she would gently massage my back, but her little hands pushed thoroughly on my back and across my neck. I was surprised at her strength. After doing this for a few minutes she said, “Turn over on your stomach,” which I did then she said, ”Take off your top.” I said, “No, Mya.” Then she said, “Everyone does Grandma.” Well I wasn’t about to take off my tankini bathing suit top. I started to laugh and called John and as I did Mya said, “Oh, never mind,” as she continued to rub my shoulders. I guess she figured she was in trouble if I called Grandpa. Much later I had my first real massage and discovered that I needed to wear a bra-type top so I could undo it for my back massage. What you don’t learn from your granddaughter! I am writing about Mya as though through rose-coloured glasses, and perhaps I am, but Mya’s disposition was superb throughout the whole holiday. She began the day early, bright eyed and ready to experience the day’s adventures until late in the evening without a break and definitely with more physical activity than most of us. She swam every day where it was possible and she would often play by herself on the beach or with other children if they were in the vicinity. She interacted with four adults constantly as well as any other visitors we might meet along the way. She was very tolerant. While dining, she would put her little head right down on the table if there was no other place to lay her weary head. We tried to provide a bench or soft area for her to lie down, sometimes putting her head on her mother’s lap and when we were through dining, Jason would pick her up and carry her to our unit or catch a cab if it was too far to walk. This happened frequently to end our busy Vietnam days. She often fell asleep at a restaurant in the evening after she had eaten some of her supper. On December 26th we decided to celebrate Christmas by going to a fancy restaurant that Jason and Rhonda had reconnoitered earlier in the day. We dressed in our fancy clothes and caught a cab to take us to this beautiful resort, about ten minutes away. We had set up a bench for Mya, against the wall, before we started our meal as we knew she wouldn’t last long and sure enough, she had only a couple of bites of her favorite meal, a “cheese only” pizza, before it was “lights out” for Mya. We spent a lovely evening together enjoying the best meal of our island holiday, while Mya slept on her bench, which was probably one of her more comfortable early evening sleeping spots! The next morning we stayed on the beach as long as possible and then packed our bags to be ready for the two o’clock airport shuttle for our flight to HCMC. We had a hotel booked from the internet for HCMC. We wanted a central hotel but also a little upscale which suited our needs with our family. We were delighted once again with our rooms and the service. We were pleasantly amazed at the quality of accommodation for the price. Vietnam is still cheap enough to travel even though the quality has improved exceedingly in the last ten years, as more tourists discover this gem. John thinks Vietnam will become more expensive in the next few years. We felt lucky to experience it before it becomes costly and too crowded. Near our hotel we found the excellent Zanzibar Restaurant. We enjoyed the ambience and relaxed while Mya ate her cheese pizza and then immediately fell asleep with her head on Rhonda’s lap. We ate in the same restaurant again the next night before our flight which didn’t leave until nearly midnight. Vietnamese restaurants are in abundance on every street so we had many choices but having experienced a delicious meal at the Zanzibar Restaurant with a euphoric atmosphere, why not repeat the experience! Vietnam is beautiful with fields of rice paddies, green valleys, warm ocean waters, mountains and forests. The people are friendly and helpful and many speak English, especially in the larger centers. After dinner we went back to our hotel passing all the beautiful hanging Christmas garlands that filled our street. It was a sight to behold and continued to keep us in awe each time we ventured from our hotel. That’s one benefit of traveling at Christmas, being able to see all the beautiful Christmas decorations! On arrival at the hotel we immediately collected our luggage and brought it to the reception. We ordered a taxi to take us to the airport, about a forty-minute drive from the hotel. We got to the Asiana Air check-in counter at the International Terminal and soon had our bags checked for Seattle, USA, via Seoul, Korea. It was late in the evening and we were all tired before our 23:50 flight. I can’t say enough about the good service we received from Asiana Air. On arrival at 6:55 am in Seoul we were taken by shuttle to a hotel owned by the airline and given a room each and a meal since our flight did not leave until 18:40 in late afternoon. That meant we had twelve hours in which to rest, shower, eat and relax. John and I found ourselves asleep for the first few hours in a beautifully decorated ultra-modern room. John said that the toilet operation needed a course in “Bidet 101” as it was so complex with all the buttons and whistles along the side of the toilet seat. At 11:30 a.m. we received a call from the reception that lunch was served in the restaurant on the bottom floor. As we were gathering ourselves together, Mya arrived at the door and planned to go to the restaurant with us. Rhonda and Jason told her she could not disturb us in the morning but it was okay now. We took the elevator down to the main floor with Mya. We had no idea we were about to learn a difficult lesson. Now every time I enter an elevator I think about the elevator in Seoul, Korea, with Mya. John was standing near the operating panel and I was off to one side while Mya stood at the back of the elevator. As we arrived at the first floor and we started to leave the elevator, Mya cried out, “My arm is stuck!” She had dropped her little elbow behind a metal round bar and couldn’t get it out. I told John to lift her up, but Mya cried louder as it hurt too much. We realized we needed help. John stayed with Mya to reassure her as she tried not to panic. I got out and told the reception that we had an emergency. They didn’t understand until they heard Mya crying, as the elevator returned to the reception floor. Someone on Floor #3 had pushed the button and John and Mya ascended to #3 and John said, “Push # 1 please, we have an emergency.” In the meantime I took the second elevator and got to the 6th floor for Jason and Rhonda. Jason was boarding the elevator as I arrived and I told him that Mya was stuck and he needed to come now. We rode the elevator down together and Jason immediately went to Mya. By this time the crew had the door locked open so the elevator didn’t move from the first floor. Jason tried to lift Mya up and he got the same reaction as John. In the meantime the managerial staff arrived with a drill to remove the screws out of the bar. However, the bar wouldn’t budge, even with all three men trying to pull on it. This all happened within minutes. I asked Jason where Rhonda was and he said, “She’s in the restaurant”,so I dashed down the stairs and looked into the restaurant and saw Rhonda holding a glass of juice in one hand and a cup of coffee in the other. I signaled her to come quickly. She dropped everything and came hurrying across the floor. As we entered the stairwell I told her it was Mya, but that she was all right. As we ascended the stairs, Rhonda heard, “911.” She knew I had said, “Mya is all right” but she caught the words, “911.” On arrival to the first floor Rhonda immediately went to Mya to reassure her and saw that she was caught in the bar. By this time three men arrived from a fire unit and one returned to the truck to get a “jaws of life” tool. He didn’t cut the bar, but used it as leverage to move the bar with the help of his two buddies. In the meantime I stood behind a pillar and bawled my eyes out and I kept thinking of Mya stuck behind that bar and I felt so badly that my heart ached. Finally, which seemed like a life-time but in reality was only a few minutes, I could hear a sigh of relief from behind the pillar as Mya was set free. I came around the pillar with tears in my eyes and Mya saw me and immediately came and gave me a hug. She must have known how sorry I felt for her and wanted to console me. After a moment she went to her daddy who picked her up and held her to him. The staff offered to take her to the hospital but Rhonda and Jason both said, “She’ll be fine.” Mya said her arm hurt, but we knew it would only be temporary. We were so thankful for the maturity that Mya had shown in such a stress-filled event. We went down to eat our lunch but I couldn’t eat for awhile as I was still filled with sorrow. John, Jason and Rhonda handled it much better than I did. Later when we got on a people-mover bus at the airport and Mya was sitting with John and I, Mya said to me, “I’m not going to stand over near that bar.” I think that was the understatement of our holiday! Our flight from Seoul, Korea to Seattle was without incident. It only took nine and a half hours compared to twelve hours in the opposite direction so we were pleasantly surprised. We had excellent service once again and we even obtained one extra seat for Mya to lie down and sleep. We arrived in Seattle at 11:30 in the morning and we immediately called a taxi to take us to Sleep Inn Hotel to pick up our truck. The receptionist was on the phone at the hotel so we just took our bags through the reception area into the parking area off the main floor. Jason had the truck backed up and ready as we loaded our five large bags, five small backpacks, and two picture tubes into the box, covered it with our roll top and climbed into our vehicle and headed north on Interstate-5 for Vancouver. Jason drove and we had no glitches, except hail and snow, but none of it lasted. Jason and Rhonda were hoping to get to Powell River today, the 29th of December. It meant we needed to make good time through the border and down the main streets of Vancouver to Ann and Frank’s place in Burnaby, where John and I would be dropped off while Jason, Rhonda and Mya continued home to Powell River. Talk about timing! We arrived at the Nadalini’s at 16:45, dropped our luggage on the lawn, and quickly said our goodbyes as John reminded Jay to drive safely as they sprinted for the 17:30 ferry. We gathered our belongings and entered the Nadalini house where we were greeted warmly. Jason phoned at exactly 17:30 and said they were on the ferry. It couldn’t have been better timing! Our Vietnamese holiday surpassed all our expectations! We all have fond memories, flash backs and “remember when” comments from Mya of our holiday in Vietnam. We all agreed it was a wonderful journey of interesting experiences, delicious healthy food and grand sites, but especially family built memories to last a lifetime. Relationships are built on trust and love and both were expressed so many times over and over again during our family holiday. For me, the beauty and pleasure of this travel experience, was seeing Vietnam with our seven-year-old granddaughter, Mya!